Landowners at Twin Bridges filed a formal complaint with the Oklahoma Department of Environmental Quality (DEQ) in May 2009 after piles of fly ash were used to rebuild the approach to the bridge that was washed out in heavy rains. "It is the policy of this agency that coal combustion byproducts, such as fly ash, not be used as road surfacing material. Fly ash cannot be used on a stream bank or anywhere it could be carried into the water of the state." 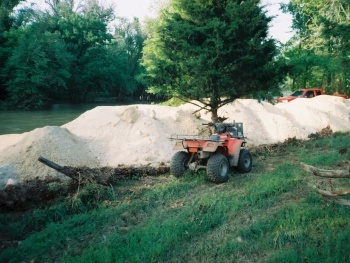 A four-wheeler is seen next to piles of dry fly ash that was being used illegally for road repair next to Spring Creek. The DEQ also took water samples upstream, at the bridge and downstream and concluded that "although the sampling did not confirm an immediate impact on the stream, repeated use of fly ash in this manner could adversely affect the stream." The Spring Creek Coalition found through web research that fly ash is being touted as an environmentally friendly way to dispose of what otherwise could be a big environmental hazard, AS LONG AS it is used as an ingredient in wet concrete and not simply dumped dry on a road. There is at least one case being litigated about the environmental hazard of using fly ash. The Spring Creek Coalition will continue to monitor this situation.